Hellbenders (Cryptobranchus alleganiensis) are habitat specialists with little tolerance of environmental change; their principal threat is degradation of habitat due to activities causing sedimentation, thermal pollution and oxygen loss. Over-collecting in the 1990s as well as injuries and death when hooked by anglers have also decimated local populations. At Mesker Park Zoo & Botanic Garden visitors can see young larvae hellbenders being reared for wild release in the nearby Blue River. 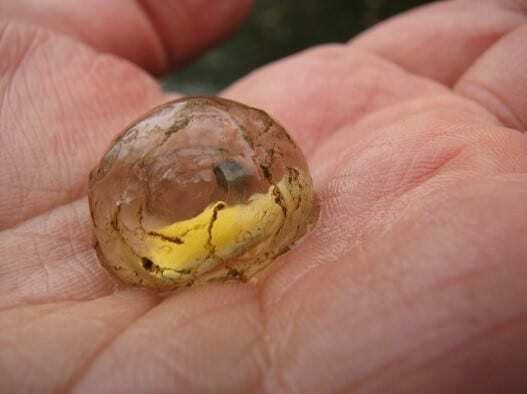 A number of zoos across the country assist with “head starting” Eastern hellbender larvae which are reared from wild-collected eggs and then released once they reach a size less likely to succumb to predators. Indiana has only recently begun to collect eggs and rear larvae in an attempt to save this endangered species, and Mesker Park Zoo & Botanic Garden offers a very unique opportunity for visitors to view what it takes to make this possible. Censuses indicate that there are likely only 50 adult Eastern hellbenders left in the wild on southern Indiana’s Blue River, and densities are so low that experts believe that the species will be extirpated within the next two decades if captive breeding efforts are not initiated immediately. Already a successful “head starting” partner with Purdue University and Indiana’s Department of Natural Resources, Mesker Park Zoo has also built the state’s first artificial stream/raceway for captive breeding larvae which is home to several wild-caught adults secured by Purdue under the auspices of Indiana’s Department of Natural Resources. 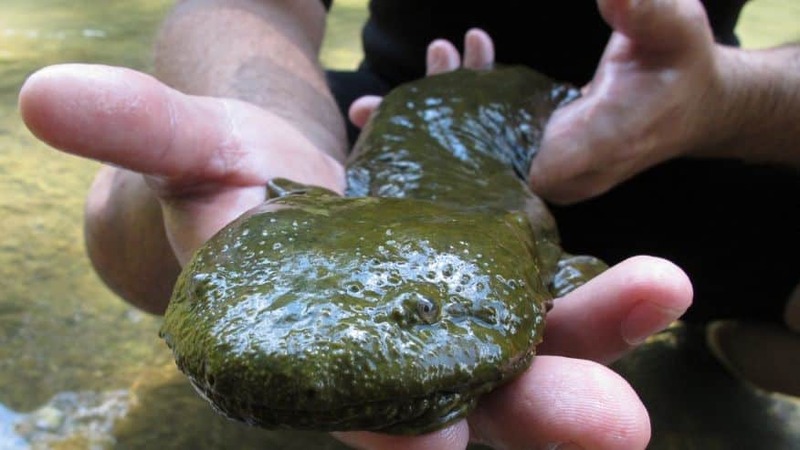 With this bold step, the partners hope to replenish the wild population and secure the future of Indiana’s endangered hellbender. Our work on hellbenders has been made possible through the generous support of the Evansville Zoological Society, Pittsburgh Zoo & PPG Aquarium’s PPG Conservation and Sustainability Fund, Aquarium and Zoo Facilities Association’s Clark Waldram Conservation Fund, and the Association of Zoos & Aquarium’s Amphibian Taxon Advisory Group Small Grant Program. We have two 12 ft chimney swift towers on grounds. On May 9, 2009 officials from Mesker Park Zoo & Botanic Garden and the Indiana University Alumni Association celebrated the accomplishments of two local Boy Scouts, Mitch Schapker and Ben Johnson. Each scout constructed one chimney swift nesting tower from a design created by Paul and Georgean Kyle of the Driftwood Wildlife Association. The scouts built them to complete their Eagle Scout service project using materials purchased by the Indiana University Alumni Association. The structures were placed in the landscape near the exit of AMAZONIA: Forest of Riches, Mesker Park Zoo & Botanic Garden’s new South American rainforest exhibit to illustrate the link between the North and South American habitats used by these declining birds. An interpretive sign illustrates the 6,000 mile roundtrip flight that chimney swifts make between Evansville Indiana and their wintering grounds in Peru. For more information see about chimney swifts and chimney swift conservation visit www.chimneyswifts.org. Mesker Park Zoo & Botanic Garden is committed to the wise use of energy and natural resources. Resource conservation issues are integrated into our decision making process. Building heating system. This allows the large boiler to be shut down for 8-10 additional weeks a year. Cleanout ports and temperature regulators have been added to increase efficiency. We offer many opportunities for recycling consumer goods. Beverage container recycling is available to our visitors and staff. Office paper and cardboard are recycled. In accordance with our Urban Forestry and Botanical Master Plan, Mesker Park Zoo & Botanic Garden has been developing a support facility for the botanical collection on a former Parks District property adjacent to MPZBG. The site had been used as a Depression era work camp before ultimately turning into a tree waste dumping ground for various city departments in the 1980’s. In 1996, MPZBG was awarded an Indiana Department of Environmental Management Recycling Grant to develop the Botanical Services Center. A large cuttermill was purchased and the process of cleaning up the site began in 1997. Over the next few years, MPZBG employees processed over three thousand cubic yards of accumulated organic waste. This has eliminated a potential pollution source for the local Pigeon Creek watershed and kept the material from going to the landfill. Through another grant from the Indiana Department of Environmental Management and administered through the Pigeon Highland Watershed Steering Committee, MPZBG has converted part of the land into a composting operation for the organic waste generated from Evansville Parks Department, Department of Urban Forestry, and the Levee Authority in addition to our own. A 4500 sq ft concrete pad was installed (August 2001) to serve as the “active” area for the compost operation. This facility reduces the waste stream to local landfills by an estimated 1000 cubic yards per year. It also provides a quality soil amendment that is used at MPZBG. This facility is an IDEM registered Solid Waste Composting Facility and is designed in compliance with IDEM standards. In accordance with our registration, MPZBG submits an annual report to IDEM. In the years 2006-2010 MPZBG composted a total of 1255 tons of landscape waste and manure. Two Greenhouses were added in 2004-2005. These facilities supply MPZBG with the appropriate plants for projects and landscape maintenance. They have also been used in the propagation of native plant material for ecosystem restoration partnerships with Howell Wetlands and Prairie Creek Barrens Nature Preserve. The development of the Botanical Services Center at Mesker Park Zoo and Botanic Garden has been the result of the cooperation and support of many entities: The US Forest Service, The Indiana Department of Natural Resources: Division of Urban Forestry, the Indiana Department of Environmental Management, Vanderburgh County Solid Waste Management District, the Vanderburgh County Soil and Water Conservation District, the Pigeon Highland Watershed Steering Committee, the Four Rivers Resource Conservation and Development Area, Inc. and the City of Evansville Department of Parks and Recreation, Department of Urban Forestry, and Levee Authority, and the Westside Improvement Association. Conservationist Award for its outstanding conservation efforts in soil and water conservation. The composting operation was noted in particular as an innovative project that addresses multiple issues of land use, water quality, waste reduction and recycling. MPZBG is situated on a beautiful hilly site with many bodies of water. The physical nature of the site couple with poor management practices in the past have led to degradation of soils, woodlands and water quality. Over the past decade best management practices for soil and water conservation have been implemented. Many of these have been made possible by cooperation with the Vanderburgh County Soil & Water Conservation District. Projects include: A demonstration rain garden by the entry complex, a low mow prairie grass demonstration garden, a native plant demonstration garden, the installation of a prairie grass filterstrip in our Asian Wild Horse exhibit, the creation of a small wetland to filter run-off from the Asian Plains area, over 650 linear feet of lakeshore erosion control plantings on Lake Victoria. In 2010, Mesker Park Zoo & Botanic Garden was awarded Conservation Educator Award by the Vanderburgh County Soil and Water District. Also in 2011, the Demonstration Rain Garden won the Leadership Evansville Environmental Project Award. In 2002, the Mesker Park Zoo & Botanic Garden zoo staff began to monitor the salamander population at Wesselman Woods Nature Preserve. During this survey three salamander species known to occur at WWNP were found to be persisting in small populations. Spring migrating salamanders are vulnerable to being killed by vehicles while crossing park roads to breeding pools. The Mesker Park Zoo & Botanic Garden zoo management recommended to the Evansville Parks and Recreation Board in 2003 that measures be taken to protect these animals during their seasonal migration. They approved and installed gates on roadways crossed by the salamanders. As a result park roads are now closed between February 14th and April 1st each year. Mesker Park Zoo & Botanic Garden continues to monitor the populations. In 2006 MPZBG provided funding to the Wesselman Nature Society to construct a box tunnel under a section of park road to create a passage in an area where it was impractical to close the roads. Mesker Park Zoo & Botanic Garden staff checks to make sure park staff are installing and maintaining barriers annually. Howell Wetlands is owned by the City of Evansville and administered through the Wessleman Nature Society. This wetland is an oxbow of the Ohio River and is approximately 22 acres in size. Remnant populations of locally uncommon plants, including passion vine and bald cypress, persist here. It was acquired as a city park after several decades of illegal dumping. Reconstructed areas are now being restored with wetland plants that have been collected from propagules collected at Howell. MPZBG raises money at annual plant sales to fund this project. In 2004, Jennifer Keller conducted weekly field surveys of the vascular plants in the wetlands during her internship at Mesker Park Zoo & Botanic Garden. In 2005 Ms. Keller finished the field survey of the vascular plants in the wetlands. She reposited additional herbarium specimens at the University of Southern Indiana and published a report of the study’s findings in the Proceedings of the Indiana Academy of Science. The MPZBG Conservation Committee continues to assist with long-term restoration plans. Beginning in 2006, MPZBG became involved in the restoration of the Indiana State Nature Preserve called Prairie Creek Barrens in Davies County Indiana. It is the only example of a sand prairie under state protection in Indiana. In spring and fall of 2006, MPZBG staff assisted Division of Nature Preserve staff in the installation of 10,000 locally adapted prairie plants that were grown for this project from seed collected near the site. 2000 of the plants were grown in MPZBG’s greenhouse facilities. Mesker Park Zoo & Botanic Garden’s Animal Curator, Dr. Susan Lindsey, is extensively involved in the United States Fish and Wildlife Service’s recovery plan for Mexican gray wolves and provide advice and assistance with behavioral and husbandry intervention as needed “on call and respond” basis. This may include on-site work at a pre-release facility in the Southwest or other facility or phone consultations. As part of her work with Mexican gray wolves she is involved in the revision of the Mexican Gray Wolf Husbandry Manual (release date in late 2011) and continues to provide expertise in maintaining the MWSSP/USFWS approved enrichment list. Our facility currently has 4 Mexican gray wolves, the most endangered wolf species on the planet, on exhibit. The two adult wolves on exhibit currently serve as “foster parents” to two male pups. The successful introduction of these pups to their new family has contributed to diversifying the wolf population with two genetically strong males whom we hope will be the first of many to be “fostered” at our zoo. The American marten is a predator species belonging to the weasel family, and is considered a culturally significant clan species to Native Americans of the region. Marten populations across the upper Midwest have declined during the 20th century due to habitat loss and excessive trapping. Wildlife research often takes place without the expertise of a veterinarian. However, due to the vulnerable nature of these animals, LRBOI wildlife professionals sought out Mesker Park Zoo & Botanic Garden to provide the most modern techniques in wildlife anesthesia. 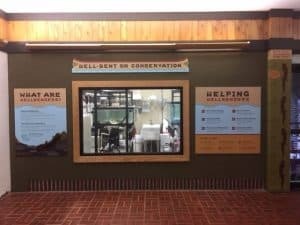 This is an important way in which Mesker Park Zoo & Botanic Garden can be a consistent and significant partner in wildlife conservation. Results of the project will be used by the Forest Service, Michigan Department of Natural Resources, and the LRBOI in its management of the forest. We thank the Evansville Zoological Society, the Minnesota Zoo, and the Pittsburgh Zoo and PPG Aquarium for their support of the American martens project.